Publisher of fan-made maps in Map storage of «HeroesPortal». Conductor of seasonal online tournaments. Master of “General” offline tournaments in Heroes Lands IV. 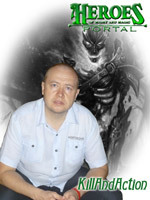 HeroesPortal's history begins in 1999 when Sergey Gorbaniov, known as Gorbik in the Internet, starts the "heroes3maps.deeptown.com" project. Although calling it a "project" is a bit excessive, as from the beginning it contained just a few Heroes of Might and Magic III maps by Gorbik himself. Soon afterwards, some maps by Gorbik's friends had been added, and it was yet later when other site visitors have begun to send their own maps. So the primordial idea for the project was to let Heroes of Might and Magic series fans to freely exchange their custom maps. The site had no commercial nature and, after existing for two years, had become a large-scale project. A number of well-known Ukrainian game magazins wrote about it, while the site itself repeatedly advertised computer clubs of Kiev and Odessa. 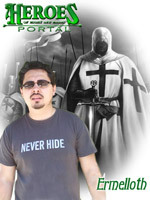 The day 7 August 2001 had been marked by the opening of the first unique offline tourney at "heroes3maps.deeptown.com". Its originality lied in its simplicity and, at the same time, romanticism. Following the spirit of Heroes of Might and Magic, the organizers tried to reflect the atmosphere of the feudal age on the portal. That tourney has become a kind of a virtual world, called the Heroes Lands by the players. Thanks to that highly appreciated idea, the "heroes3maps.deeptown.com" organizers have found sponsors who've proposed to enlarge and enchance the project. 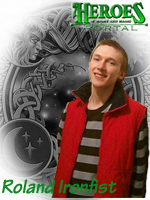 Such was the www.heroesportal.net foundation, which we celebrated on 21 January 2002. So what is HeroesPortal now? Today the "Maps" section contains over 3000 maps for Heroes of Might and Magic, Heroes of Might and Magic II, Heroes of Might and Magic II Gold, Heroes Of Might and Magic III, Heroes of Might and Magic IV and for all their expansions, and Heroes of Might and Magic V.
It contains screenshots of every map level, visually reflecting its drawing quality. Every map has a download counter. This lets the author know how much people have tried his map to date. and, of course, the description supplied by the author inside the map itself. We also have a manual rating system. That is, you can vote for any single map you like (or dislike). You may post comments for any map. Author can also answer to your comments and hold debates, thus creating a mini-forum. You will find game descriptions, useful articles, mapmaking tips etc. in the Library section. 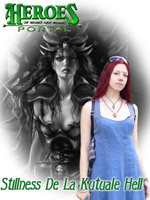 The site has a lot of other sections dedicated to the Heroes of Might and Magic series. These sections contain really EVERYTHING (perhaps even a little more). The "Tavern" section contains a number of forums and a chatroom, called respectively the Tables and the Barstand. 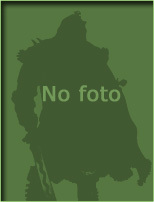 This is the place for our visitors to communicate and exchange their opinons about www.heroesportal.net project. Our forums have adopted a special speaking style, reflecting the spirit of the Middle Ages which had served as a basis for the Heroes of Might and Magic series. The Magisters (administrators) of the Portal are constantly enhancing the resource with the help of our citizens (HeroesPortal visitors). 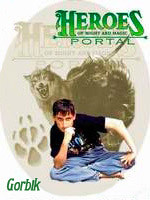 HeroesPortal is an international project: besides the Russian version, it also has an English one. We also won't mind if you speak behind the "tables" in any other language which is suitable for you. You'll surely find someone ready to keep up the conversation. The "Portal Events" section provides you with information about meetings, tourneys and other actions and events organized by the Portal team. The Magistracy is also planning to hold regular tourneys, similar to the $2000 Krasnodar tourney with prize fund. Such tourneys are a great opportunity for the players to meet in the real life. "Heroes of Might and Magic" - is not just a great game. It is like complicated and romanticized chess. The game developers themselves remind us about this similarity by using images of chess pieces in the interface. And our portal's motto can be expressed as follows: "To restore the chivalric traditions through modern technologies".